The blog about technology by Luis M. Campos. The expression "Game Changing" technology should be used in technology that already exists, when it's taken to a level of efficiency and simplicity that it never had. I remember when we launched Oracle Exadata in Europe, the expression was often used. The sheer performance of the system was accomplished by solving a fundamental problem of latency between the compute layer and the storage layer, amongst other very smart innovations built on top of this new paradigm. It took some time until it reached mainstream status, but eventually it did. Within the Oracle Data management plethora of technologies there are certainly other examples that could be called "Game Changing" technologies. From the top of my head I remember at least three more: Coherence, Big Data SQL and Private Cloud DBaaS (Database As A Service). Luckily enough I've worked on almost all of them as both a business developer, enabler and evangelist, except Private DBaaS! So you can imagine my surprise and awe when I first kicked the tires of the Public DBaaS offering in its metered service. Public means it's out there in the Oracle Cloud Platform (PaaS), in a data center near you. The basic difference between metered and non-metered it's like when you go to an asian restaurant and choose between A-La-Carte (metered) and All-You-Can-Eat (non-metered) for a fixed price. If you look at the documentation here, you'll see that provisioning a new database, in this fashion, is really easy! With the screen shots I'm about to show you in this article you'll see how fun and addictive it can be! Who would ever thought that creating a new Oracle Database instance would be this cool! It's definitively a "Game Changing" thing. The first step you need to take is to get hold of a trial account. 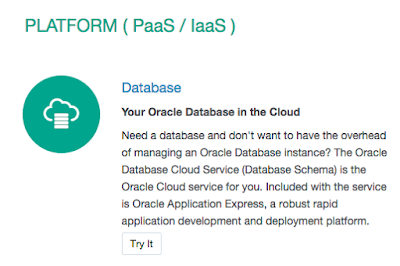 In order to get one you should navigate to this page, look for the PaaS section and click in the "Try It" button of the Database service. See below. 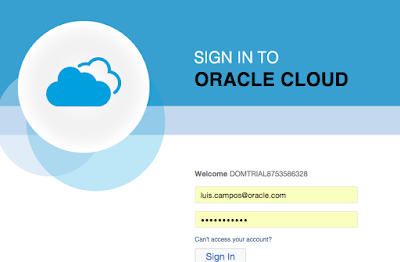 If you already have an oracle.com account you should use it here, if not then you will have to get one. Once you have a trial account, it will have a certain period of validity within a certain domain. All you have to do is login using that domain. Beware that a cookie will be stored in your session that will memorise the domain to which your account was provisioned and if you already have an Oracle Cloud account in another domain, you might need to use another browser, or go in incognito mode. In the following screenshot my domain is DOMTRIAL8753586328. Once you get in it's time to start creating services, and in this case a new Database Service! In this case you can see that we already have a database service created called "mycloudDB". 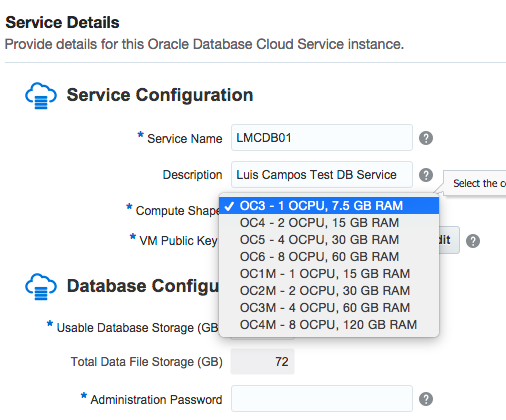 It's an Enterprise Edition 12c version database and is using one Oracle CPU (OCPU). Later you will see what Extreme Performance means and how can you change the amount of memory and storage. Because this screenshot does not show it, you can't see that in my domain I actually have 2 database services, hence the totals above show 2 of each. These are the amounts that will be used together with the type of service created to bill you in the end of the month, or hourly. Let's get started! This is a very important decision. There's a big difference between having a virtual machine with the software pre-installed (VI) or having a full blown automated service with special cloud tools. If you choose a VI service you still have to create the DB instance, configure all those countless parameters, networking, the whole 9 yards. But if you just want to have a working instance together with the "special cloud tools" I've mentioned, then you will want to go with the full database service. 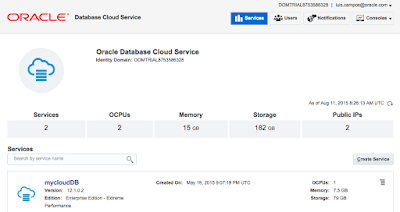 In the Oracle Cloud Platform as a Service and Infrastructure as a Service (Public Cloud) price list you have two prices for each combination. For instance, a simple VM database service Enterprise Edition (with no options) is billed $1,500 per month, or $2.52 per hour that is active. If you choose the hour counter you'll pay $60.48 per day, and after a 31 day month you'll have consumed $1,874.88 worth of this service. It's only a wise decision to be billed by the hour if you know that the instance is only to be used for 3 weeks or less. After 24 days it's no longer worth it. This is the part where you get to choose the Oracle Database version. As of today you have two versions available, which covers a very wide range of applications out there. 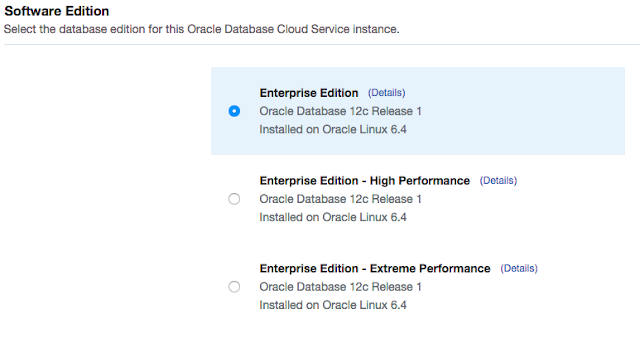 If you have the need for a 10g database or less, maybe this is the perfect time to create a 12c cloud instance and start your migrating process! We all need to have these limitations every once in a while to get change started. Be sure to check also the operating system version, although you won't need to worry about it. Wether you choose one or the other, there will be no impact in the metered price. This is where you need to worry about price! Like when you are configuring your new car online, there's always a chance to super charge it with extra options and more power. The basic Enterprise Edition includes the powerful set of database features, but no options. You can also have Standard Edition One for $600 per month or $1.008 per hour. But if you choose the second one (High Performance) you'll get: partitioning, advanced compression, multi-tenant, advanced analytics, spatial, graph, real application testing, all enterprise management packs (tuning, diagnostics, lifecycle, data masking, cloud management), OLAP, advanced security, label security and database vault! All this for $6.72 per hour or $4,000 per month. The Extreme Performance includes all the options mentioned above plus In-Memory database and Active Data Guard. If you want to see an In-Memory demo done by Maria C, check out this video. Now it's the time to choose the power of your database in terms of computing resources. All balanced combinations are displayed for you to choose, although I doubt you'll get the most out of the In-Memory option if you don't purchase at least 30GB worth of memory. The next step is to upload your ssh key. If you want to know how to generate it, follow these instructions. 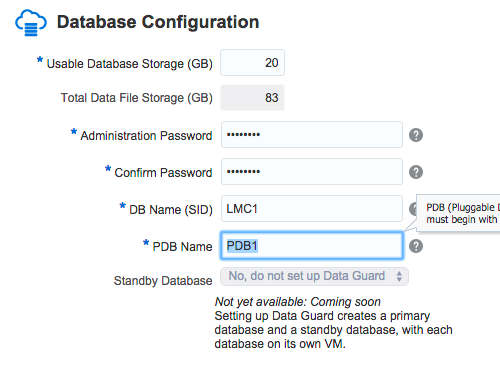 In case you have chosen a database service with the multi-tenant option, this will mean that you need to name both your container database and the pluggable one (PDB1). 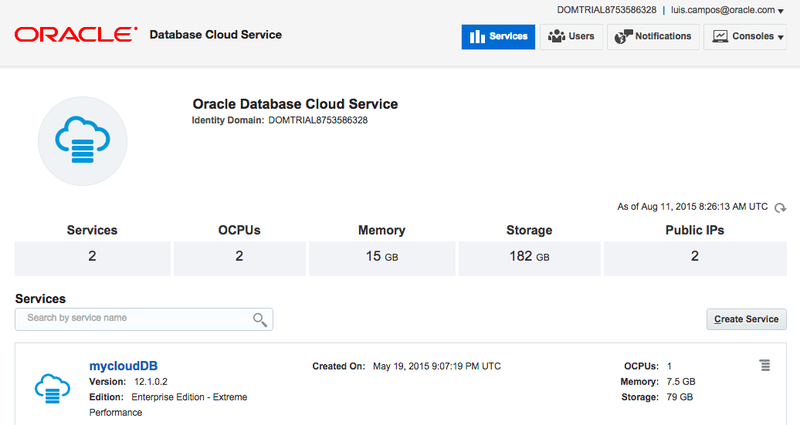 Don't worry if you're not comfortable with Multi-tenant technology yet, in the Oracle Cloud you'll have a brand new tool to help you manage your PDBs and CDBs (container DBs). The tool goes by the name of Oracle Pluggable Database Self-Service Provisioning. Because I've chosen an automated database service, I will have available among other automations, the backup service configured. 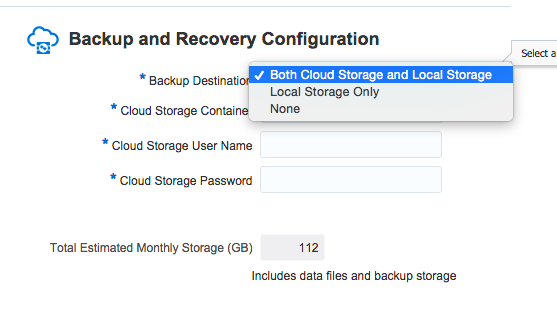 It's up to me if I want to store those backups in my local storage (compute node) or the Cloud Storage (for which I will need a Cloud Storage container to be created previously). Finally we are done and it's time to submit the job of creating the service, that will take some time, because not only dedicated compute power needs to be assigned, but also software installed together with my database instance created. In my example, it took around 30-40 minutes, but depending on the domain assigned to you, this time can change. I will probably come back to this blog to get deeper into these tools, but with blogging I've learned not to make promises ;)! As a former DBA and someone who suffered a great deal with patching in the past, the automation of this task is probably something that pays the instance on the first month. 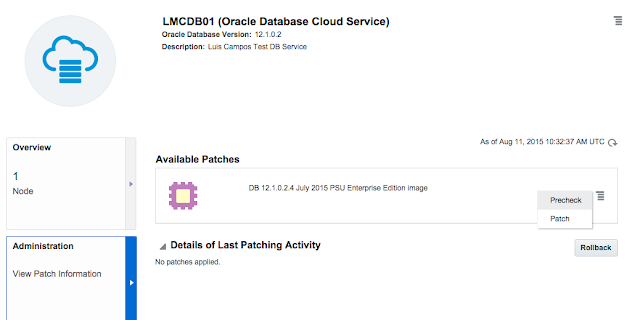 In the newly created database service, there's the chance to get hold of the patching done during the service creation process (which was none in this case) and also get the chance to deploy other available patches. In the case below there's the July 2015 PSU patchset available. Since it's a newly created service you might want to go on and have this done, so you can get ready to start transferring data. You can always pre-check, apply it or roll it back. As you could see this cloud service and automation are truly a Game Changer in the Data Management arena, and one that no IT or Business person can ignore. In fact the real kicker is when you start using these services in hybrid architectures, or as a way to offload development and testing. I urge you to get your hands dirty with this new way of consuming technology platform services and also help the service to get better. Cloud Platform Director at Oracle Corporation for Europe, Middle East & Africa. I blog about Enterprise Computing but my views do not represent Oracle. Data Science, Cloud Platform, Innovation and Lateral Thinking. None of the posts here represent Oracle, but only my view. This view complies with Oracle Corporation social media policy.